A stunning little dish - our recipe for shrimp pasta with lemon and cheddar sauce shows why Italian food is universally loved. Simplicity and great ingredients. The flavors of delicate shrimp, fresh lemon, rich cheese, aromatic herbs and peppery arugula are balanced perfectly in this dish. Easy, fast and tasty. 1. In a pan, add salt to water and cook the pasta al dente. 2. Fry the shrimp in a hot pan in olive oil for approx. 2 minutes. 3. Mix egg yolks, lemon- juice and zest, lemon thyme, black pepper and Castello® Extra Mature Cheddar. 4. Add the cooked pasta to the pan with shrimp with 1/4 cup of pasta water. 5. Reheat for bit, and add the egg yolk mix, while stirring and quickly remove it from the heat. 6. 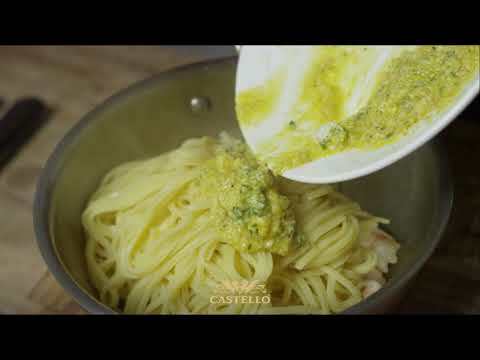 Plate the pasta and top with arugula, olive oil and grated Castello® Extra Matured Cheddar and serve immediately.